Babanga and Amesen Kennels saw the arrival in August 2008 from Chethang, one of the UK's top Kennels Chethang Nathaniel. "Nate" is a very stylish gold Male, combining top bloodlines from both the UK & US. Nate gained the title of Australian Champion very quickly. His wins have included both All Breeds Best is Shows, Runner up Best in Shows, Best in Group, many Runner up Best in Group, Class in Group and Class in Show awards. Nate has also been awarded Best in Show Speciality. 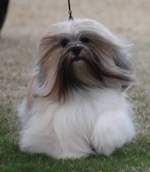 These wins have been under Local, Interstate and International Judges including Breed Specialists. 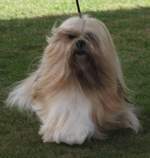 When Nate became a Grand Champion in 2010 he was the youngest Lhasa to achieve this Milestone. He was 2 years 5 months & 4 days old. When the title of Supreme Champion was introduced in July 2012 Nate had all the qualifications for this title as well so again another milestone was achieved and be became. We are very proud of his achievements and look forward to the future with a beautiful boy still so young. It's not all about the winning it's about the quality as well and Nates Progeny have achieved so much we would like to share these achievements with you. Australian Supreme Champion Amesen Parti Til U Drop 'Paris' BISS BIS Multi class in group and class in show. Australian Champion Babanga Solitary Man 'Rocco' Multi BIG class in group class in show and class in Speciality Show.